I can not beleive how gorgeous it looks. I am jelous!!! . Lamps looks great. Great job. By the way do you have any idea how to bleach the wood furniture. Lately I have been seeing this in lot of magazines.I would like to know if you have any idea. I really like the chest, so much better. It really does look good. 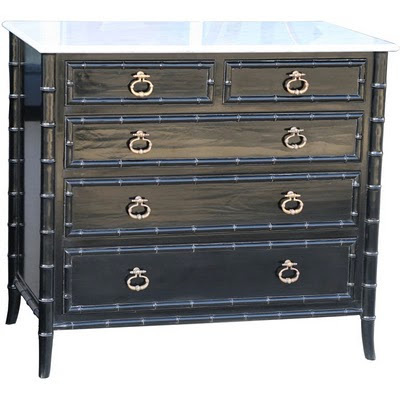 Not scary, add a little bit of glam with the knobs or a little glitz with a reflective mirror on top of the chest? 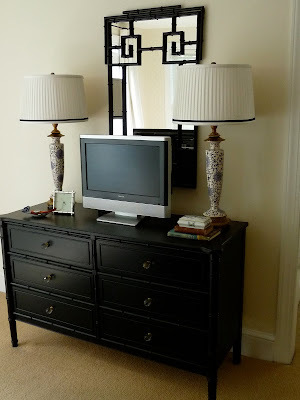 Maybe a pop of color on top of the dresser or a runner in front of it? I like the black base now just a little pop of color and you are in bizzzzness! Great job... I love a chick who'll get her hands dirty. SO much better painted! New hardware should help the blah. Or maybe some grasscloth and a sheet of glass cut to fit the top? Such a score, I'm still envious. I'm also glad to know the formica painted out well. I'd like to try the Fine Paints of Europe, I gotta find something to paint. Wow, that looks absolutely gorgeous! You did an amazing job on the paint! I have to say, I love tips and info about painting, or redoing an older piece! I'm sure everyone else loves the help too! I just purchased the same piece from CL for dirt cheap.. The guy had the whole set and I refused to buy it now I regret it so badly..
Now I see it on ebay what I paid $20.00 is selling for $300.00.. I really like the black color but I am afraid to make a mess and cannot go near the paint & brushes.. Kudos to you. it looks gorgeous! happy halloween! Nice work! I'm on the hunt for boo and haven't had any luck. I second the votes for new knobs to dress it up, or adding a small stack of colorful hardback books to brighten up the top?